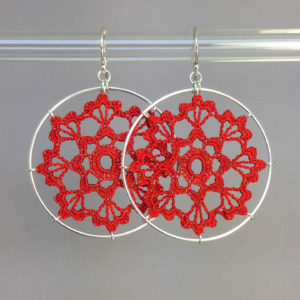 Crocheted doily jewelry is handmade by Leisa, a lifelong crocheter. 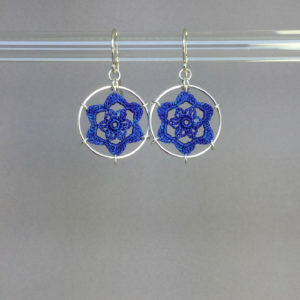 All designs are either adaptations from vintage doily and tablecloth motif patterns, or my original designs. Fancies: These are, well, the fanciest! Diameters range from 1-3/8″ to 1-5/8″. Graces: Just under Fancies in terms of complexity. Diameter is just over 1″, about the size of a quarter. 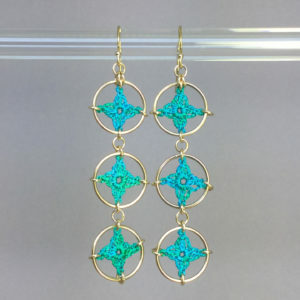 Delights: These are my original designs, smaller and considerably simpler. Diameter is 7/8″, about the size of a nickel. 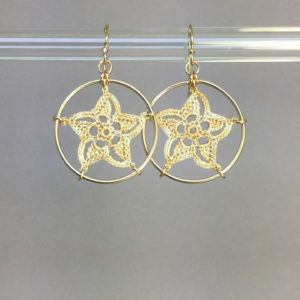 Spangles and Stars: A tiny bit of crochet in a tiny hoop! The diameter is 5/8″, smaller than a dime. Spangles can have all sorts of color combinations. This shop is for sales within the US. Outside the US, please visit my Etsy shop.